Yesterday, I wrote about a curious case I had just investigated for MUFON. The case started out looking as though it may have some interesting twists to it: it involved some UFOs that had physical and psychological effects on the three witnesses, and allegedly transformed reality and caused some missing time... 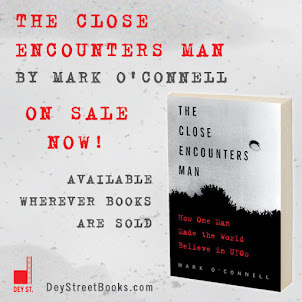 But then when I interviewed the woman who had reported the sighting, I quickly learned that the only strange effect the UFOs had was to terrify the woman and her two companions before they disappeared. The witness had told me that she would try to get the other two people -- her fiance and her best friend -- to talk to me, and so last night I talked to them both, separately. I would like to say that the two new interviews helped to clarify things, but in fact they have only muddied the waters. Which is not to say that I wasted my time. I'm actually quite fascinated with the way the three accounts fit together, and what they can tell us about eye-witness testimony. The first version of the story from Witness #1 appeared here yesterday, and if you haven't already read it you should, because the rest of this will make more sense if you do. There's never any traffic, is there? She told of a terrifying ride in a truck after dark on a country highway. She was in the right rear seat of the truck with the two sleeping kids, and was able to see three lights in a straight line up in the sky. Then a fourth light appeared and all the lights were behind the truck now, chasing them down the road. Somehow the four lights formed a triangle at this point, then they veered off to the south and could be seen beside the truck, still giving chase. She and Witness #1 were screaming in fear the whole time and telling Witness #3 to drive faster to get away. Witness #3, who had been heading east all this time, suddenly turned south to parallel the Lake Michigan lakeshore, when one of the UFOs was seen "whooshing over a field." They entered a state park and suddenly the road was filled with "a horde of animals" from the park running away from the UFOs and trying to get the truck to stop. You can bet my ears perked up at the mention of rampaging deer, elk and beavers fleeing from UFOs and trying to flag down a speeding SUV, but on further questioning the witness clarified that there were only raccoons involved... Still, there was a horde of them, and they were fleeing from the UFOs and trying to stop the truck. She told me they finally reached the gas station and got out of the truck, only to see "a whole cluster" of UFOs in the sky, at least 4, 5 or 6 of them. She said they were "bright orange-y, reddish, yellow." These UFOs vanished from sight, and that's when Witness #2 realized that their 15-minute drive to the gas station had actually taken an hour and half. Damn, there's your missing time, right there! I got off the phone with #2 not sure what to think. Her story had matched up with that of #1 in many important ways, but would Witness #3 back them up as well? He began by telling me of watching the UFOs from the side of the road, before the "chase" began. He said that when his truck's lights were off, the UFOs would start moving, but when his lights were on, the UFOs would stop moving. This was the first I had heard of this. Then he described the "chase" down the highway. At first he could see the three lights in his left-hand mirror; they were above the treeline, and were casting light on the trees. 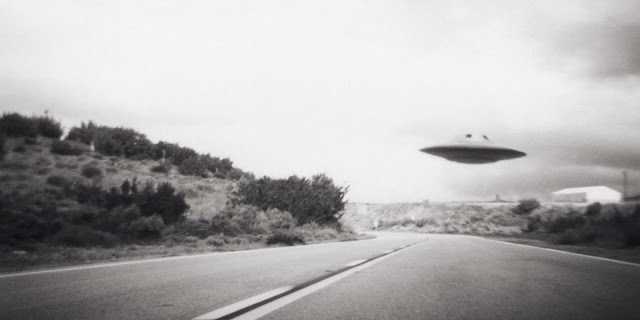 Later he saw the four UFOs directly behind the truck in his rear-view mirror, but when they veered off to the side of the truck he lost sight of them. At this point he was driving faster and faster in response to the screaming of the other two witnesses, and it was all he could do to keep the truck on the road, so watching for UFOs was out of the question. He then told me that when the truck headed south they came upon of "a family of raccoons" on the road, and he had to slow down to drive around them. Funny how one person's "horde" can be another person's "family." Soon after, they reached the gas station and it was over. I asked him to specify the last moment at which he saw the UFOs, and he said it was that last look in his rear-view mirror during the "chase." I then asked him how much time had elapsed between the first sighting of the UFOs and their arrival at the gas station, and he said "10 minutes." Those last two points were the kickers for me. Witness #3 did not see the second appearance of the UFOs once they were at the gas station, and he did not experience any missing time. By the time we wrapped up the conversation, I wasn't even sure if he had been in the same truck as the other two witnesses. He even said, "I couldn't see what they were looking at" for a lot of the time. Yeah, it appears this case has some real problems. To say the least. The obvious question here is, what's actually going on? Lying? Confabulation? Delusion or hysteria? Or, if the witness reports are viewed by you as credible, despite the contradictions, what accounts for the significant variations in their recollections? What motivations may be in play? And, how would and could you really be able to tell, for sure, either or any way? Plus, by your discussing the case in public here on your blog, aren't you risking witness contamination and engendering negative feedback if any of the witnesses google your name and read this 2-part account by you of the contradictions you point out? 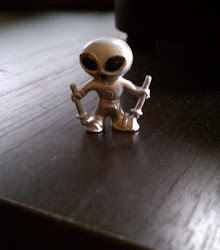 Over the four + years I've been writing about my adventures as a MUFON Investigator, several witnesses have googled me and found my blog, and not a one has ever complained. Some of them, I admit, would have had reason to complain, but I never write about any witnesses who request anonymity, and I report what was said accurately. A big reason I do this is to gain an understanding of what kind of person reports a UFO, what makes them want to report it, and HOW do they report something so unusual and bizarre? You may disapprove, but I don't think you can say I'm contaminating the witnesses, since I'm commenting on their testimony after they've given it.